There is a 1940 S-200 Gibson archtop that used to belong to Roy Rogers. There’s a 1947 Martin D-18 that used to belong to Hank Williams. Buddy Holly’s leather covered Gibson J-45 from around 1942 or 43 also features. On the electric side there is a beautiful ’55 Fender Esquire from Luther Perkins and a leather-covered Broadcaster that used to belong to Waylon Jennings. We quite like Johnny Cash’s 1973 Martin D-18 and his black Fender Malibu (pictured, at least partially). 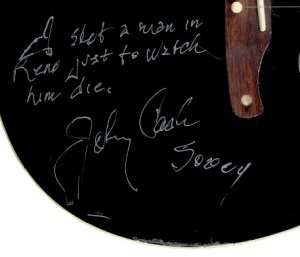 Both are signed by Cash and this latter bears the wording “I shot a man in Reno just to watch him die”. It’s dated 2004. Of course, if none of that is tempting, you could always buy Johnny Cash’s boots. Size 12, apparently. You can see all of the lots at Christie’s (I’ve filtered for musical instruments on this link – if you want the boots, you’ll need to view all).